Make the most of your stay by experiencing the many wonderful activities and attractions around this natural unspoilt region we call home. We can assist with information, maps and bookings to ensure you get the most out of you time in our beautiful city. Some activity operators provide transport to and from Sport of Kings Motel and we also have discounts available for many of the wonderful attractions so please ask us before booking. Rotorua is the adventure capital of New Zealand and provides first class mountain biking trails along with many other fantastic activities including tree canopy walks, skyline luge, bungy jumping, white water rafting, fishing, paddle tours, jet boating, zorbing, 4-wheel driving, helicopter and floatplane flights - just to name a few! 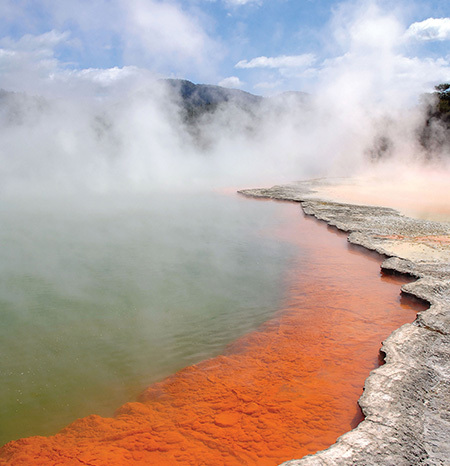 Rotorua is perhaps best known for its thermal attractions. The unparalleled experiences of Wai-O-Tapu Thermal Wonderland, Te Puia Thermal Reserve, Orakei Korako Hidden Valley are never to be forgotten. The unique culture of the Maori people is magnificently showcased in live shows for which Rotorua is famous. From the traditional cultural performance to the awesome, spine tingling haka and the sumptuous multi-course hangi feast, an enriching evening awaits. Immerse yourself in the sights, sounds and flavours of Maori culture by visiting one of Rotorua’s Maori villages. Learn about rituals, customs and traditions, such as the Powhiri, a formal welcome ceremony. Experience art, song and dance, like the world famous Haka. And don’t forget to enjoy the food! A variety of options are available – bookings are required. Feel free to ask us for more details or booking assistance or have a look at the links below.